Multiple student discounts allow you to offer a reduction in tuition fees for families with multiple students taking classes with you. They can be used with classes using either Billing Method of By Class Fee or By Total Hours. For classes that have a Billing Method of By Class Fee, a multi-student discount is defined using a Tuition Discount Rule. The Discount Rule can be created as only a multi-student discount, or it can be added in combination with a multi-class discount using a combination rule type. See the Manage Discount Rules (Tuition Billing Method By Class Fee) section of Help articles for more details and examples. If you are using the Billing Method of By Total Hours, and you set Post total hours per to Student in Post Tuition Fees, you can include multi-student discounts. 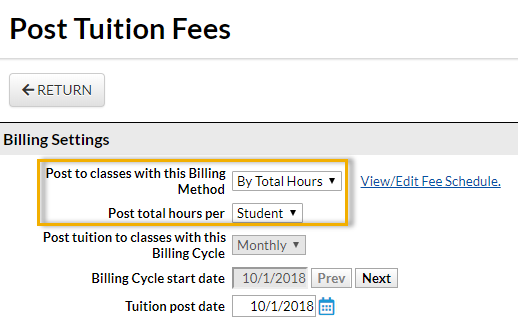 The multi-student discount is defined in your Total Hours Discount Settings in Tuition Settings from the Tools menu > Edit Settings.